This workshop seeks to consider an alternative means of developing sustainable communities via water, in order to help reduce the pressure of developing higher densities on land. In the same instance, the workshop seeks to tackle some of the prevalent issues relating to urbanization – in particular achieving density, combating climate change, fostering community, and optimizing adaptability. The historic setting of Venice will form both the location of the workshop and the brief, with the intention of being able to create innovative water-borne modular communities of the future that should be able to adapt to a variety of different water borne settings around the World – i.e what may be applicable to Venice in 2014 should be able to adapt to Dhaka in 2020. The Workshop will be conducted by Jason Pomeroy in collaboration with Luigi Croce and other Iuav professors. Jason Pomeroy is an award winning architect, masterplanner and academic at the forefront of the sustainable built environment agenda. He graduated with distinction from Canterbury School of Architecture and Cambridge University, and is the Founding Principal of Pomeroy Studio. In addition to leading the design and research direction of Pomeroy Studio, he lectures internationally and publishes widely. He is the author of ‘Skycourt and Skygarden: Greening the Urban Habitat’ and ‘Idea House: Future Tropical Living Today’ and is a visiting professor at the University of Nottingham and the Università Iuav di Venezia. He sits on the editorial board of the Council of Tall Buildings and Urban Habitat and is an active member of the Singapore Green Building Council. Jason is also the host of "City Time Traveller" an award-winning architecture travel series on Channel NewsAsia and a featured speaker at TEDx Singapore. Dal 12 al 22 gennaio 2015 sono aperte le iscrizioni al workshop di Jason Pomeroy, visiting professor, University of Nottingham, dal titolo "The zero carbon amphibious live / work unit – padiglione galleggiante a emissione nulla". Sono riconosciuti 4 crediti formativi universitari tra le attività formative a scelta dello studente (tipologia d), agli studenti iscritti al terzo anno del corso di laurea triennale in architettura costruzione conservazione e agli studenti iscritti al corso di laurea magistrale in architettura per il nuovo e l’antico, che parteciperanno con profitto al workshop in tema di progettazione di un padiglione galleggiante a Venezia. 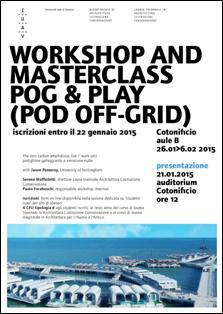 Il workshop si svolgerà nel periodo 26 gennaio - 6 febbraio 2015 in aula B – Cotonificio veneziano. Potranno partecipare al workshop i primi 60 studenti iscritti al terzo anno del corso di laurea triennale in architettura costruzione conservazione e/o al primo/secondo anno del corso di laurea magistrale in architettura per il nuovo e l’antico.